Today is the final day of my internship in the Section of Archaeology at the State Museum of Pennsylvania, and shortly I will begin my senior year as an archaeology major at Mercyhurst University in Erie. Working closely with Dr. Kurt Carr, the goal of my internship project was to organize the artifacts of the Barry Kent projectile point type collection (BKC), and place them into Riker mounts. 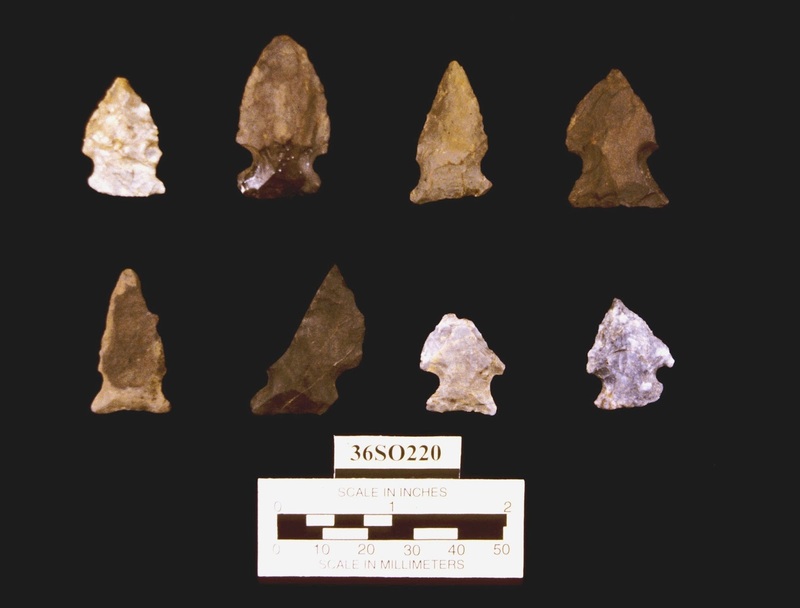 More than 3,000 projectile points are in the BKC, which also includes other interesting lithic artifacts such as adzes, tool blanks, bifaces, beads, drills, gravers, pendants, steatite vessels, and plummets. The purpose of the project was to improve accessibility to the artifacts, which would ensure that more of the artifacts are used when the staff engages in outreach programs in educational public forums. 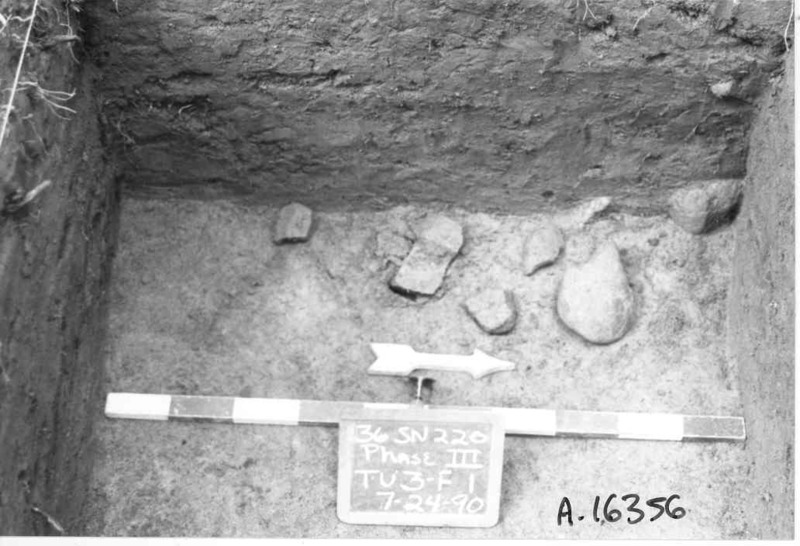 I prepared for my internship by completing Dr. Carr’s suggested readings, which provided background information on the important sites that aided in building the chronology of eastern Pennsylvania, and the diagnostic projectile point types of the region. The next step was to retrieve the projectile points from storage and organize them by diagnostic type. The types I used are: Kirk, Palmer, Charleston, and St. Charles (Early Archaic); MacCorkle, St. Albans, LeCroy, Neville, Stanly, and Kanawha (Middle Archaic); Piedmont Stemmed Types B and D (Late Archaic); Perkiomen, Lehigh and Susquehanna Broadspears, and Orient Fishtails (Transitional); Hellgrammite (Early Woodland); Jack’s Reef (Middle Woodland) and triangles (Late Woodland). The lithic material categories used are: argillite, chalcedony, chert, jasper, metarhyolite, quartz, and quartzite. I then confirmed or completed the catalog number for each point, and labeled them with a specimen number as needed. To make sure the catalog number was correctly assigned, I needed to consult the collections archives. Janet Johnson introduced me this database that includes card catalogs, and paper files; some of the documents in those files dated to the early 20th century and can be thought of as artifacts themselves! Janet helped me master the previous and current museum cataloging systems, and a bit about the history of the collections. Cali Holmes, Andrea Carr and a Rapidograph pen helped me to label the artifacts. Once each point was labeled, the catalog number was put into an Access database along with the descriptive and quantitative details of the point. Finally, the points were put in Riker mounts, photographed and stored in draws. The internship was not just play either! Liz Wagner and I repeatedly battled the beast that is Access. Jim Herbstritt provided garden fresh tomatoes (probably due to the dietary staple ramen noodle discussion) and literature resources. I had the opportunity to flintknap at the State Museum during a Learn at Lunch Time event with a visiting flintknapper, Steve Nissly, which may have involved an assault on innocent chert. There were multiple lithic material type consultations involving our curator in geology, Steve Jasinski and energetic pop-ins from Walter Meshaka (curator in botany). On a lighter side, some of the most memorable events were showing off the archaeology lab to my friends Amber and Jack (Amber sketched the broadspear) and the cookie-based intern farewell parties! Many thanks to everyone for being consistently available, and enthusiastically supportive. Working with you all presented me with a unique view into the daily working life of a team of career archaeologists! This weekend, August 31st through Monday September 2nd, our staff along with a few volunteers will be participating in the 16th annual Native American Pow-Wow on City Island, Harrisburg as part of the 2013 Kipona Wine, Art and Blues Festival, the Capital City’s send-off for the unofficial end of Summer. Situated along Championship Way on the far side of Metro Bank Park, home of the Harrisburg Senators, the State Museum of PA’s Section of Archaeology display will include the ever popular recreated 20ft. dugout canoe, artifacts recovered from excavations conducted on City Island in years past, informational brochures on State Museum programs, children's activity worksheets, and the hot off the press 2013 Archaeology Month poster. Keep your fingers crossed for good weather, and we hope to see you this weekend at the pow-wow on City Island. This Week In Pennsylvania Archaeology’s journey takes us to Sullivan County located in the northeastern section of Pennsylvania. 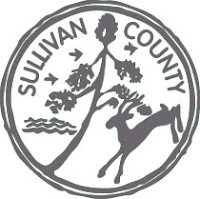 History tells us that Sullivan County’s name origin is not without controversy. According to Pennsylvania Local Government, an official state publication, the county was named after Pennsylvania Senator Charles C. Sullivan who played an engaging role in adopting legislation to form the county in 1847. An alternative side states that the county was named after General John Sullivan who George Washington sent north and in 1779 succeeded in destroying many of the major Iroquois villages in Pennsylvania and New York State (Godcharles 1933). The success of Sullivan’s expedition was a major turning point that broke the foothold of the Iroquois at the dawn of our Nation’s birth. Sullivan County was formed from part of Lycoming County on March 15, 1847 and became the 13th of Pennsylvania’s 67 county system. It contains 452 square miles and presently it is home to more than 6500 people. The region is known as the “Endless Mountains” for its panoramic scenery comprised of beautiful forests and deep cut stream valleys. Ricketts Glen and Worlds End State Parks noted for their popularity with hikers, campers and day trip visitors are situated there. 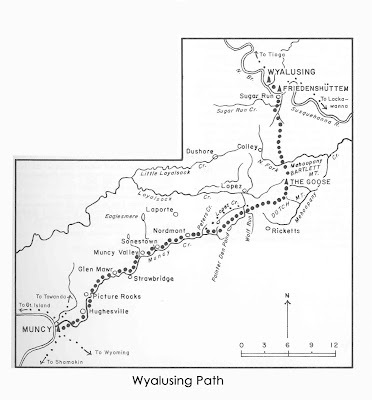 Prior to, and well into the 18th century, two major Indian trails, the Towanda and Wyalusing Paths, were used by Indians and Europeans when traveling between the West and North branches of the Susquehanna (Wallace 1971). 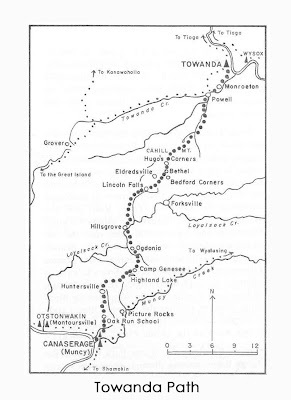 The pathways originating at the Indian town at Canaserage at present day Muncy, Pennsylvania led to Towanda and Friedenshutten, respectively. These places, and many others, were temporarily occupied by the Shawnee, Delaware or Lenni Lenape, Chickasaw and other 18th century Indian groups (Donehoo 1928; Kent et.al. 1981). Physiographically, Sullivan County is contained within three prominent sections, the Deep Valleys Section, the Glaciated High Plateau Section and the Glaciated Low Plateau Section. All of these have certain hallmarks that characterize one from the other. Going back in deep time we see the general complexion of Sullivan County as a primeval brackish watered landform created during the Devonian (Lock Haven Formation), through Pennsylvanian (Allegheny Formation) periods (405-290 million year ago) when primitive plant and animal life, such as ferns, club mosses, giant dragonflies, shell and fin/scale fish were common and interestingly primitive. In the formerly glaciated sections of northern and eastern Sullivan County small pebble and cobble size rocks of igneous (granite), cryptocrystalline (chert) and the harder, more resistant sand/siltstone rocks occur in drift and moraine-like deposits. These and other lithic materials were accessible and, indeed, used by prehistoric Indians for stone tool production. Some of these lithics types i.e. quartz and granites, were also pulverized and incorporated as tempering material in pottery clays. In the Pennsylvania Archaeological Site Survey (P.A.S.S.) 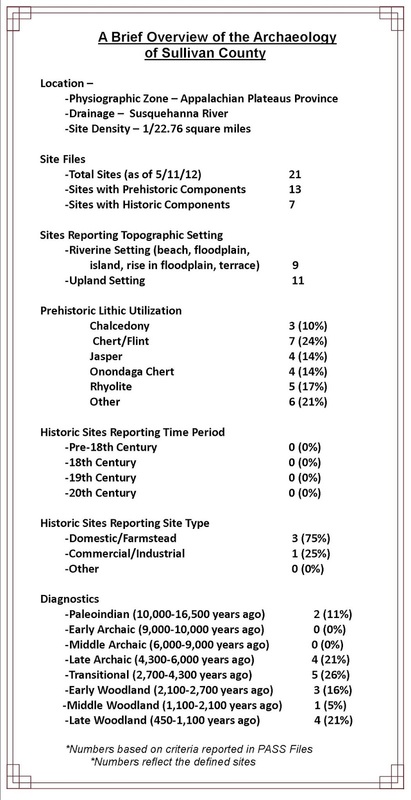 files listing of 21 prehistoric and historic sites for Sullivan County we note that site settlement patterns are essentially split between river bottom and upland locations thereby demonstrating that both environmental settings were important to Indians and Euro-Americans alike. Few Historic period sites have been documented and the data suggests that these were principally small farmstead complexes comprised of a dwelling, barn and various out buildings. Unfortunately the information is not complete enough to ascribe these sites to a particular period of occupation. 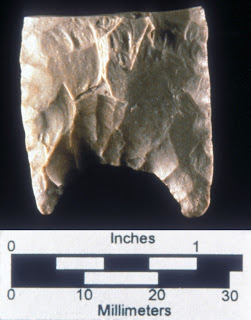 The most commonly found lithic material at sites is chert. Along with chalcedony, these are likely from local sources. Jasper, metarhyolite and Onondaga chert are found at 45% of the sites. Some of these rock types are non-local and may have been obtained from as far away as central/western New York. It may, however, have a more local source from the glacially derived deposits that are cited above. Whatever the case, Onondaga chert was a common lithic type used in Sullivan County from the Paleoindian through the Woodland periods. Although, admittedly, the sample size is very small it is interesting that the percentage of non-local lithics is very high. This may coincide with the greater frequency of Transitional Period site use (26%) in Sullivan County over all others that have been reported to date. We hope that you have enjoyed this brief archaeology tour of Sullivan County and do join us next week when we will journey to Susquehanna County. 1928 A History of the Indian Villages and Place Names in Pennsylvania. Harrisburg. 1933 Pennsylvania: Political, Governmental, Military and Civil: Political and Civil History Volume (First edition ed.). New York, New York: The American Historical Society. 1971 Indian Paths of Pennsylvania. Pennsylvania Historical and Museum Commission. Harrisburg. This week’s journey by county through the archaeology of Pennsylvania takes us to southwestern Pennsylvania and Somerset County. Somerset County falls primarily within the Allegheny Mountain Section of the Appalachian Plateau Province, although a small portion of southeastern Somerset County falls into the Allegheny Mountain Section of the Valley and Ridge Province. Overall, the topography of Somerset County is rugged and mountainous. One mountain in the county has the highest elevation in Pennsylvania at 3213 feet. Somerset County is drained by the Youghiogheny and Casselman Rivers, which form a portion of the headwaters of the Ohio River Drainage. The Raystown Branch of the Juniata River—part of the Susquehanna River Drainage—originates in Somerset County, as do several headwaters of the Potomac River. As such, this region’s geographic placement indicates that it potentially served as a crossroads between cultural developments that occurred in different parts of the Northeast and Middle Atlantic regions. The majority of archaeological sites in Somerset County occur on or adjacent to the extensive areas of floodplain near Meyersdale and Confluence. Two American Indian trails, Nemacolin's Path and the Turkeyfoot Path, are known to have crossed through Somerset County. 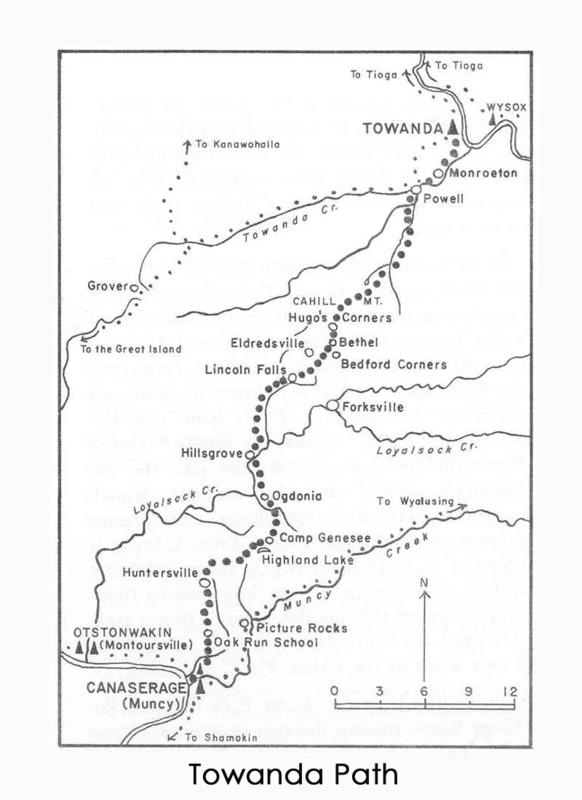 Nemacolin's Path ran from Wills Creek near Cumberland, Maryland, to the confluence of Redstone Creek and the Monongahela River. The Turkeyfoot Path at the confluence of Wills Creek and the Potomac River near Cumberland, Maryland and continued to Confluence, Pennsylvania. The interconnectedness of southwestern Pennsylvania with the eastern portions of the state and with Maryland to the south was clearly established by 1800 B.C., as evidenced by the distribution of raw materials such as rhyolite and steatite. By the Late Prehistoric period (A.D. 900 to 1600), these Native American paths may have reached their peak usage. American Indian habitation of Somerset County dates back to the Paleoindian period. Somerset County has one of the denser concentrations of Paleoindian sites found in western Pennsylvania. Surface finds include a cluster of at least seven Paleoindian fluted point discoveries located on the Casselman River near Meyersdale in Somerset County, Pennsylvania. There is a relative scarcity of recorded Early Archaic points in Somerset County and therefore few recognized Early Archaic sites. Compliance investigations in the Meyersdale area uncovered a handful of Early Archaic components based on diagnostic artifacts, largely from non-stratified contexts. 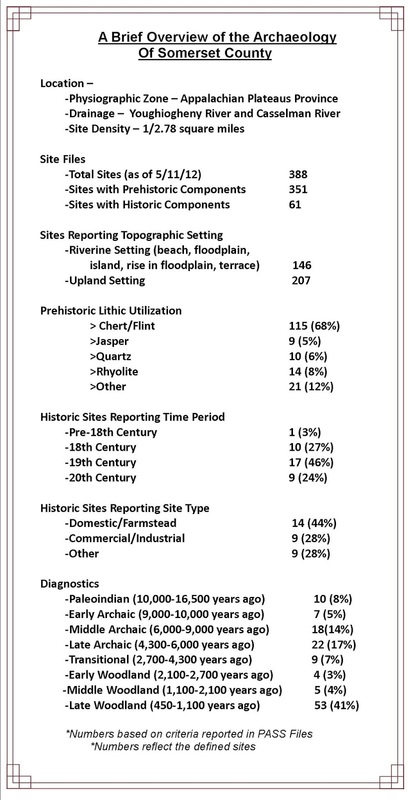 Similarly, recorded Middle Archaic sites are rarer in Somerset County than other parts of Western Pennsylvania. However, recent investigations in the Meyersdale area did encounter sites with Middle Archaic diagnostic artifacts including LeCroy bifurcate projectile points. Late Archaic populations in western Pennsylvania are characterized as specialized hunters and gatherers intensifying their use of specific resources, such as fish, and during this period the initial domestication of eastern seed plants occurred. Base camps were likely in floodplains and low terraces of high order streams. 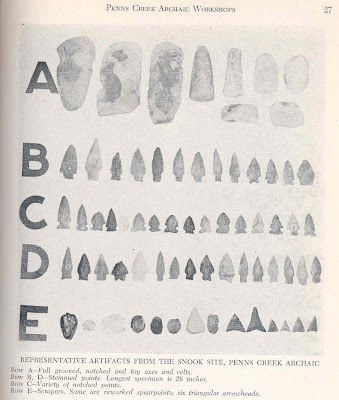 Otter Creek and Brewerton notched points are the dominant Late Archaic projectile point forms recovered in Somerset County. Late Archaic sites are well represented in the vicinity of Meyersdale, with representative components at 26 sites in the form of over 100 diagnostic points, including Brewerton Corner Notched, Eared Notched, and Side Notched varieties, as well as to the Lamoka type. Sites with Late Archaic components in the Meyersdale area are distributed across a wide variety of topographic settings, including the floodplain/terrace systems of the Casselman River and tributary streams, saddles, and lower slopes. 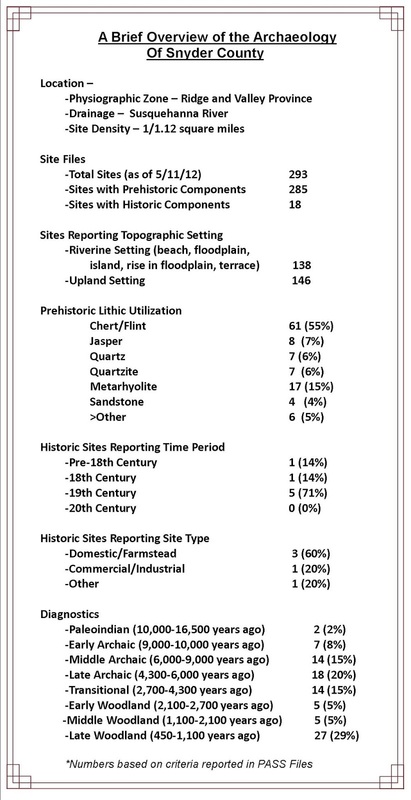 This distribution of sites indicates extensive utilization of the local landscape. The Early Woodland period saw the introduction of pottery to Somerset County, but otherwise settlement and subsistence patterns continued relatively unchanged from the Archaic period. 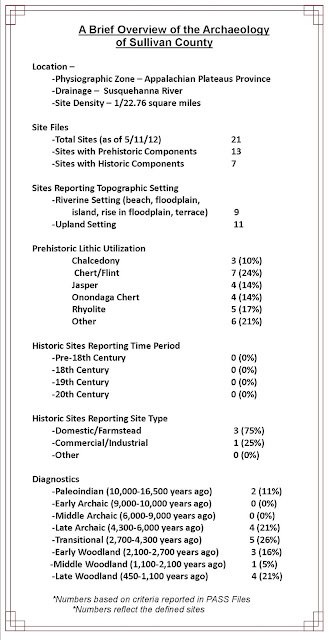 Investigations in the Meyersdale area recovered only ten sites with Early Woodland components, suggesting that some Late Archaic diagnostics may have been used into this period. Middle Woodland sites are also sparsely represented in Somerset County, perhaps for the same reason. 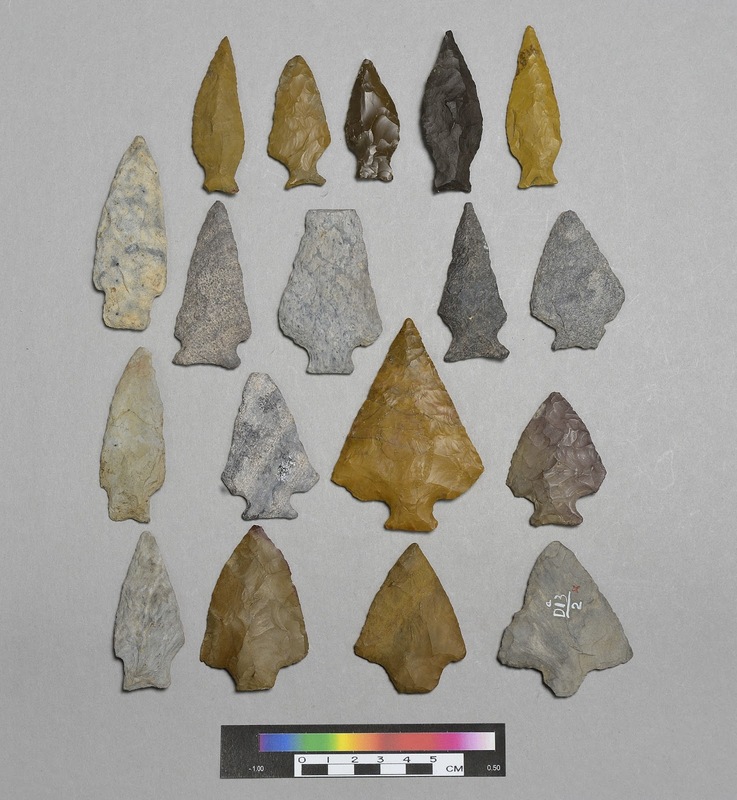 Late Woodland sites are better represented by diagnostic projectile points, including Backstrum, Chesser Notched, and Jack's Reef Pentagonal types. One particularly intriguing Late Woodland site was excavated in the Meyersdale area. Analysis of data recovered in excavations conducted at The Field W-E site (36So220) revealed use of the site from the Late Archaic through the Late Woodland. During earlier occupation periods it was utilized as a short term camp site or bivouac. In the Middle Woodland to Late Woodland it is hypothesized that this site served as a periodic gathering place for surrounding hamlets. Two shallow trenches were identified and within each a series of postmolds, possibly fence or screen-like barriers. Analysis of remains recovered from two hearths revealed heavy seasonal use during the Middle and Late Woodland periods. This use of a site as a “vacant center” is consistent with settlement patterns observed elsewhere in the Ohio River Valley and central Pennsylvania, but was previously unrecognized in the region. No evidence for house remains were discovered as would characterize the subsequent Late Prehistoric period. The best documented sites in Somerset County date to the Late Prehistoric period and are associated with the Monongahela culture. The widespread adoption of maize agriculture is often thought to have spurred people living in scattered hamlets and other sites to join together in village communities during the Late Prehistoric period. Communities may also have gathered into compact village sites as a response to cooling caused by the Little Ice Age. Monongahela villages in Somerset County consisted of a ring of houses around an open central plaza and were usually surrounded by a plaza. Some Monongahela continued to live in hamlets even after the rise of village communities, and several rockshelters dating to the Late Prehistoric period have also been excavated. The last Monongahela village inhabited in Somerset County, located near Meyersdale, is Peck 2 which dates to the early 1500s. The Monongahela living here may have joined other communities further to the west. When the first Europeans crossed into what was to become Somerset County, refuge groups of the Iroquois, Mingoes, Lenni-Lenape or Delaware, and Shawnee inhabited the area. Several major Native American trails that crossed Somerset County were integral to European expansion into and through Western Pennsylvania. The hostilities between Britain and France discouraged settlement in the area of modern Somerset County. Thomas and Richard Penn, sons of William Penn, purchased parts of Somerset County from American Indians after the Treaty of Fort Stanwix was signed in 1768. Somerset County itself was actually formed out of Bedford County on April 17, 1795. The increasing population in the future county of Somerset was no longer willing to travel long distances to register legal documents at county offices in Bedford. In the early decades of the nineteenth century, the newly formed Somerset County played an active role in the movement of settlers to regions further west. Although many inhabitants of Somerset County during the nineteenth and twentieth centuries were farmers, industrial development in the vicinity of Meyersdale is particularly noteworthy. The coming of the railroad in the mid-nineteenth century especially influenced the growth of local businesses. During the twentieth century, industrial development reached a peak and then a decline while the surrounding rural area became fully integrated into industrial dairy and coal production. Historic archaeological investigations in the Meyersdale area in particular document key aspects of this transition. Somerset County has a rich history of archaeological investigations. Major archaeological investigations in Somerset County were initiated at the height of the Great Depression. Some leading scholars at the time argued—incorrectly—that there had never been a substantial aboriginal occupation of the region. 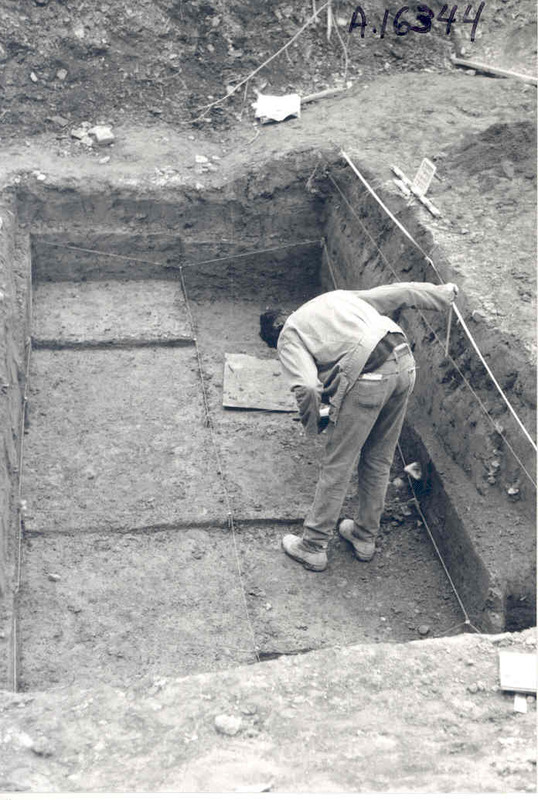 From 1934 to 1940, the New Deal-funded Somerset County Relief Excavations undertook large-scale excavations of village sites to address this issue, as well as to provide sufficient work to keep a crew of men continuously employed. Local citizens interested in the County’s past helped guide the project director, Edgar Augustine, to probable village site locations. One of these citizens was Flora Church, a member of the Pennsylvania Historical Commission, and a prominent resident of Meyersdale. 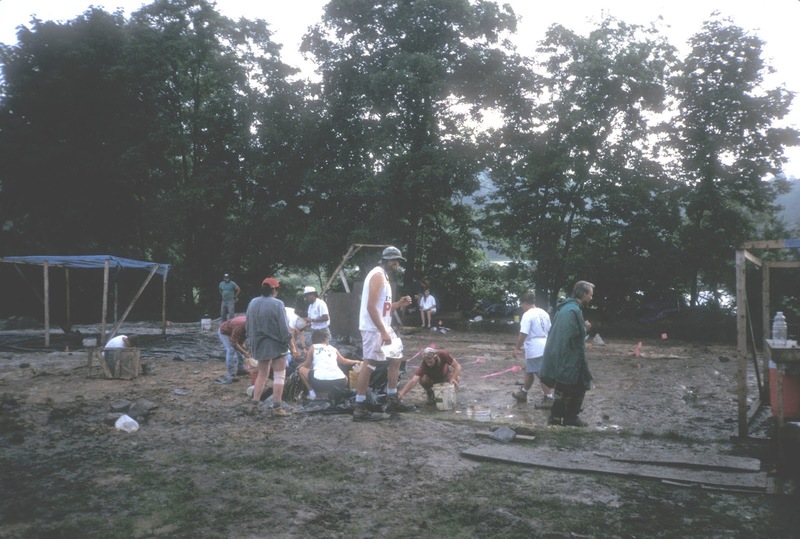 Mary Butler developed the first formal definition of the Monongahela Culture based on ring-shaped village sites excavated by these work relief crews. The Carnegie Museum of Natural History, aided by avocational archaeologists—especially the Somerset County Archaeological Society—documented and excavated a number of archaeological sites in Somerset County. The most notable of these was the excavation in the early 1970s of the Gnagey No. 3 site, which consisted of two overlapping Monongahela village components. Beginning in the 1990s, most excavations in Somerset County have been driven by compliance-related studies, most notably the U.S. 219 Meyersdale Bypass Project. The construction of a five-mile bypass around the town of Meyersdale led to the investigation of over 60 archaeological sites, with eight sites studied in extensive detail. Research efforts initiated during the U.S. 219 Meyersdale Bypass Project, but continued independently, have made extensive use of curated collections of artifacts and field notes, especially those held by the Archaeology Division of The State Museum of Pennsylvania. 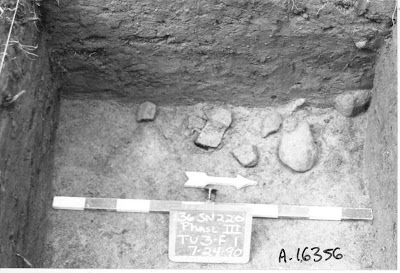 These research efforts of curated collections have led to new theoretical and methodological insights into Monongahela village settlements, a revised radiocarbon chronology for Somerset County, and a reconsideration of the history of archaeological investigations—particularly those associated with New Deal work relief crews. The importance of Somerset County’s heritage is further realized by the application of cutting-edge 3D artifact scanning technology of archaeological findings from the county. We hope you have enjoyed this journey into the archaeological heritage of Somerset County and you are inspired to research the archaeology of this county through the resources listed below, or seek out the archaeological heritage of your own county through this web site. Many thanks to our repeat blogger, Dr. Bernard Means, for his contribution to TWIPA. 1939 Three Archaeological Sites in Somerset County, Pennsylvania. Pennsylvania Historical Commission Bulletin 753. Pennsylvania Historical Commission, Harrisburg. 1965 Geology and Mineral Resources of Southern Somerset County, Pennsylvania. Pennsylvania Geological Survey, Harrisburg. 1983 The Gnagey Site and the Monongahela Occupation of the Somerset Plateau. Pennsylvania Archaeologist 53 (4):1-79. 1993 Monongahela Subsistence-Settlement Change: The Late Prehistoric Period in the Lower Upper Ohio Valley. Journal of World Prehistory 7:71-120. 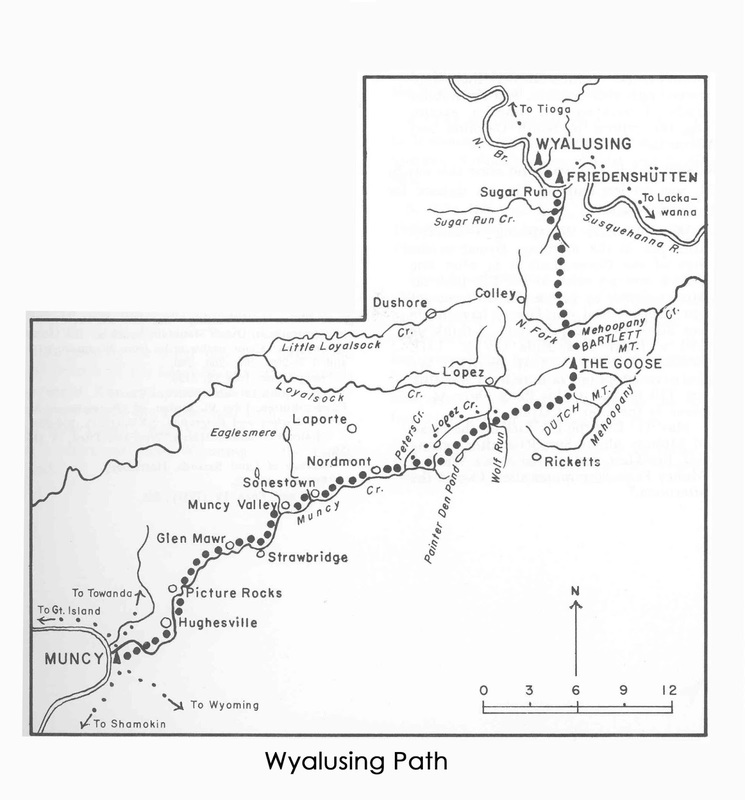 2002 The Later Prehistory of Meyersdale, Pennsylvania, and Its Surroundings: An Overview. North American Archaeologist 23 (4):281-307. 2005 New Dates for New Deal Excavated Monongahela Villages in Somerset County. Pennsylvania Archaeologist 75 (1):49-61. 2007 Circular Villages of the Monongahela Tradition. The University of Alabama Press, Tuscaloosa. 2013 Archaeologist #.00000000000000000: Edgar E. Augustine and New Deal Excavations in Somerset County, Pennsylvania. In Shovel Ready: Archaeology and Roosevelt's New Deal for America, edited by Bernard K. Means, pp. 48-64. The University of Alabama Press, Tuscaloosa. 1993 Indian Paths of Pennsylvania. Originally published 1965. Pennsylvania Historical and Museum Commission, Harrisburg. This week we're taking a pause from our county by county archaeological tour of Pennsylvania to spotlight the Section of Archaeology's Keystone Intern this summer, Jennifer Webb. My name is Jennifer Webb, and I’m a Keystone Intern. (“Hi, Jenn.”) I applied for a PHMC internship in archaeology and GIS at the tail end of my junior year at Kutztown University, where I major in history and anthropology. When I received a callback from Janet Johnson, I was surprised and pleased. My time at the PHMC is split between Noël Strattan, who supervises the Cultural Resource Geographic Information Survey (CRGIS) at the Bureau of Historic Preservation, and Janet Johnson, a curator in the Section of Archaeology at The State Museum of Pennsylvania. For Ms. Strattan, I entered and corrected CRGIS artifact data that State Museum archaeologists had catalogued over the years. My work for Ms. Johnson was a bit more varied, including data entry; cleaning, sorting and re-shelving artifact collections; scanning old archaeological journals; digging at Ephrata Cloister; assisting another intern with a lithics and projectile point typology project; and attending a meeting at Cornwall Iron Furnace. Regarding the CRGIS, not only was the entire system being overhauled, but in many cases the State Museum and BHP had received conflicting data concerning archaeological sites. It was up to me to convert artifact information to the new system (“brick”, for example, became “architectural—ceramic”) and then resolve the differences between the data sets. Amy Jukus, the intern coordinator, diversified my days at the PHMC by organizing several tours and field trips for the interns over the course of the summer. These included a walking tour of Harrisburg’s historic district, a special tour of the capitol building and a day trip to both Ephrata Cloister and Landis Valley. In addition, Joe Baker, a Penn DOT archaeologist, arranged a weekly seminar for Penn DOT and Keystone interns. During these seminars, we learned about cultural resource management, heard amusing anecdotes of Mr. Baker’s experiences in historic preservation, and attempted to solve problems that might arise during the course of building a bridge or widening a road. He also took us down to Washington Boro, so we could see in person what we had been working on in theory. Now that I have completed my internship, I am looking forward to my senior year at college and then apply to grad school. I would like to get a master’s degree in archaeology, but I may end up going for a history degree or some other related field, depending on where I am accepted and the programs offered. Overall, it was a deeply educational experience that I would certainly recommend to anyone interested in museum studies, cultural resource management or historic preservation. The opportunities to meet and work with professionals in the field, as well as the “extracurricular” activities that allowed us to stretch our legs, were very much worth the commute! This week’s journey by county through the archaeology of Pennsylvania takes us to central Pennsylvania and Snyder County. This county is situated in the Appalachian Mountain and Susquehanna Lowland sections of the Ridge and Valley Physiographic Province. The region is characterized by long linear ridges and valleys. Drained by the Susquehanna River which forms its eastern boundary, the county is situated at the confluence of the West and the North branches of the Susquehanna. The major tributaries are Middle Creek and Penns Creek. The county was first occupied by Europeans in the 1740s. By the 1750’s Native Americans were becoming distressed with the intrusion of settlers into the region and disillusioned with the Colonial government’s attitude toward the treaties it had signed. In 1754, they conducted a series of raids in the Penns Creek valley that became known as the Penns Creek Massacre. This was one of the events that led to the French and Indian War. Fort Hunter in Dauphin County was originally established as a safe-haven for the local settlers. The density of sites (at 1 site per 1.12 square miles) is high compared to other counties. Most of the sites were recorded by amateur archaeologists. The county is heavily developed along the Susquehanna River but much of the county remains rural. This has protected archaeological resources from urban sprawl. The sites are not evenly distributed across the county and the vast majority are located along the two major tributaries and the along the Susquehanna River. Chert is by far the most common lithic material for stone tool production. The second most common is metarhyolite which was either traded or brought from the extensive deposits in South Mountain, over 100 miles (160 kilometers) to the south. Although there are jasper quarries just outside of State College (70 miles or 110 kilometers) in the Penns Creek drainage, jasper artifacts are not common. Shriver chert is part of the Onondaga/Old Port geologic formation that dates to the Devonian Period and is found in a narrow band that extends across the county from east to west. A major quarry is located near Selinsgrove. As part of a federal highway improvement project, Shriver chert was the focus a of multi-disciplinary research study that examined chert quarries, areas of heavy usage, and areas of lower intensity utilization. Twenty chert outcrops were identified but only three of these were actually mined by Native Americans. The remainder were of poor quality. The distribution of where Shriver chert artifacts were found in central Pennsylvania was also mapped. A second part of this study involved investigating various methods of chert sourcing – locating where specific artifacts were quarried. The geologists at A.D. Marble were able to identify a variety of microscopic and geochemical methods for distinguishing Shriver chert from other chert types but none of these techniques were able to identify specific sources (quarries) within the Shriver formation. It was concluded that simple thin section analysis may be the most effective method for identifying cherts in this region but many more samples need to be analyzed from this formation (or any chert formation) in order to pinpoint more specific quarries. Several important archaeological surveys have been conducted in the county. One of the earliest was by James Bressler who examined a series of sites along Penns Creek (Bressler 1960). This drainage begins at Penns Cave in Centre County and enters the Susquehanna River at the Isle of Que. Therefore, it was probably a major avenue of travel. In addition, he noted that chert quarries also likely played a role in attracting Native Americans to the region. Although he noted Late Woodland camps all along the creek, Bressler felt that the major sites were Archaic in age. One of the most significant excavations conducted in the county was the testing of site 36Sn220 by Patricia Miller, an archaeologist at KCI Technologies. This projected was part of the widening of U.S. Route 11/15 that stretches for 35 miles from Clark’s Ferry to Shamokin Dam. The site is situated on the lower (T1) terrace of the Susquehanna River and extends for approximately 245 meters. It is well stratified and cultural occupations are buried to a depth of approximately one meter. These date from Late Archaic through Late Woodland times. The site was excavated in 10 cm levels within natural soil stratigraphy. Although the site produced several interesting features and examples of Late Archaic and Transitional technological characteristics, the most significant conclusions involved projectile point types and trade and exchange. 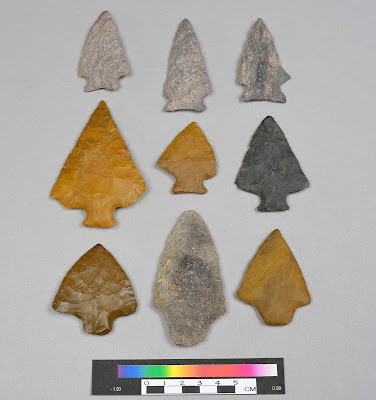 Regionally known as the “Coe axiom”, archaeologists in the past believed that each projectile point type represented a different culture and usually a different time period. This was based on the observation that individual levels or occupations at stratified sites were characterized by one type. For example, the Late Archaic period in the Susquehanna Valley is characterized by a variety of stemmed projectile points such as Popular Island, Lackawaxen or Bare Island types. The following Transitional period is characterized by broadspears, such as Susquehanna, Perkiomen and Lehigh types. As an extension of the Coe Axiom, archaeologists frequently used projectile points to date sites. Absolute dating methods such as carbon-14 cannot be used at most sites and archaeologists were using projectile points as stand-ins (proxies). Transitional projectile point assemblage following the "Coe axiom"
In the 1990’s this concept was questioned as individual occupations were found that yielded multiple projectile point types. For example, at several sites, stemmed points were found with broad spears but it was speculated that animal borrows, root action, flooding or a combination of these activities were the cause of this mixing of projectile points from different time periods. At 36Sn220, Miller found stemmed points in both Late Archaic and Transitional period occupations and she did not feel it was due to mixing. She hypothesized that broadspears and stemmed projectile points were used by the same peoples. Based on subsequent excavations, broadspears seem to have been used only during the Transitional period but stemmed projectile points were used over a long period of time during both the Late Archaic and Transitional periods. 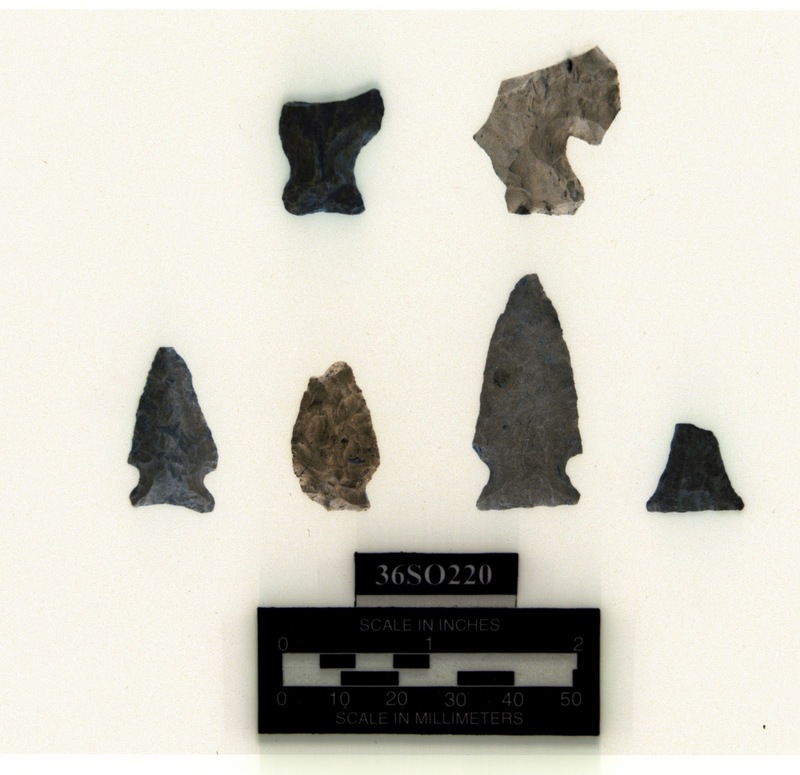 Since Miller’s investigation, several other sites have been excavated where stemmed projectile points were used over a long period of time. Archaeologists are now more careful when using projectile points to date sites, making their research more challenging as a result. We hope you have enjoyed this journey through the archaeological heritage of Snyder County and that you will seek additional reading in the references provided below. Understanding and exploring our archaeological heritage is crucial to our understanding of human behavior and our ability to change and adapt over time - just as the peoples of Snyder County have done for thousands of years. 2003 Archaeological and Geological Study of Shriver Chert in Snyder and Union counties, Pennsylvania: Alternative Mitigation for the Troxell Site (36Sn91) S.R. 0522, Section 043, Bridge Replacement Project, Franklin Township, Snyder county, Pennsylvania, ER# 97-6002-109. Prepared for Pennsylvania Department of Transportation, Engineering District 3-0. 1960 The Penns Creek Archaic Workshops. Pennsylvania Archaeologist, 30(1):25-29. 1998 Lithic Projectile Point technology and Raw Material Use in the Susquehanna River Valley. In The Archaic Period in Pennsylvania, Edited by Paul A. Raber, Patricia E. Miller and Sarah M. Neusius. pp 91-120.